We had a blessed time as we ministered recently at the Anaheim Christian Center at a conference with Meri Crouley, where the Holy Spirit moved powerfully and most of those who came got impacted heavily. Some people told us they drove out from pretty far away places just to hear us, which was a blessing to know. A young lady who drove all the way out from the Valley area to hear us, shared how she was introduced to the gifts of the Holy Spirit through another meeting we did a couple years ago at a Hispanic church, and is now moving forward fully in the gifts of the Spirit! That was a blessing to get that praise report from her. We were sharing about some moves of God like the birth of the Foursquare Movement with Aimee Semple Mcpherson, and the healings and miracles with Kathryn Kuhlman, as well as Lonnie Frisbee’s connection to Kathryn Kuhlman, and how God used him as well as others like John Wimber; it was a powerful time. The Holy Spirit moved on the message in power and we had an awesome move of God with many deeply impacted for the Kingdom of God. We went up to LA the next day and we were doing some street power evangelism in Santa Monica where we prayed for people that God led us to. The encounters were powerful and we saw quite a few people ministered to, as well as those with whom we shared the Gospel. It was being filmed, as the people we were with are seeking to make a program with that theme. It was a powerful time and we were really blessed! 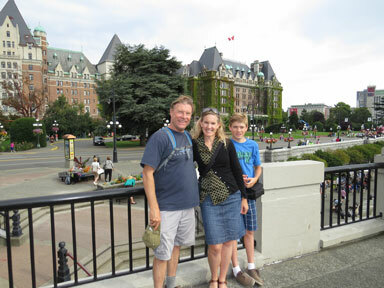 Taking in the City of Victoria. Leading worship and ministering in Victoria. 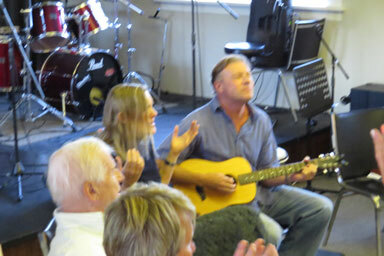 We recently returned from ministering in Canada once again. This is the third trip there in just over a year. The first trip we went to minister in Fort St. John where we were invited to speak and lead a conference as well as ministering in Vancouver. The second time we ministered in Vancouver and Victoria after being invited up to my stepsister’s cabin in the mountains. This recent trip was on Vancouver Island, in the city of Victoria and surrounding towns, where we ended up doing a lot of ministry. We just went up to Canada this time in obedience to the Holy Spirit’s leading without anything really planned at all. We were blessed by the way the Lord went before us and supernaturally opened doors as well as the open hearts and hospitality of the people there. We spoke and ministered with Bob and Sue Brasset at a church that meets in what is called the Obed House, where a number of people from different congregations came together for the meeting we did. We were blessed not only to speak and minister but do the music that night as well. The Holy Spirit was poured out in power, and many were filled and empowered, and there was also a powerful healing of a woman with a lot of pain who left rejoicing after having been healed. We shared at a spontaneous house meeting in Victoria right after this with friends Dave and Stephen and many were touched and filled with the Holy Spirit. We got to sharing about the Jesus People Revival to the young people there, who were eating up the message with hunger, and we were stoked to see them filled and empowered as we ministered together. Pastor Sean was touched as we ministered to him at the house meeting, and we gave some prophetic words too that touched him; this led to us being invited to minister at his church in Langford called Salvation House right after this. Many new believers were in the church in Langford so we focused on the redemption of Christ and the work of the Holy Spirit and the need to be filled with the Holy Spirit. Many were ministered to and some filled for the first time, and we also personally prayed with a couple of them to surrender their lives to Christ. 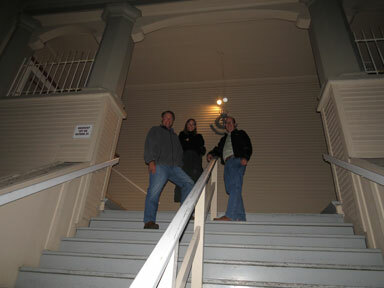 Our friend and mentor Harald Bredesen's old church in Victoria. We ministered at a meeting in Saanich after this, where we connected with Pastors Dan and Susan, who also happened to have experienced the Argentine revival in the past at around the same time we were there in Argentina during the revival too. As we were sharing about our time in Argentina, the Holy Spirit started moving in the meeting, even while we were still speaking, and a few were getting touched even as we shared. As we ministered, there was a palpable presence of the Lord reviving hearts in a powerful way. As I was praying for one particular woman that night, I had a word for her about being on a trail and carrying a letter with Good News on it. As she heard this, she opened her eyes and said she had just joined a hiking group where she was beginning to share the Gospel with the other hikers! The Lord moved in great power at this meeting and we celebrated late into the night. We also ministered at another church that meets in a helicopter hangar in Saanich with Pastor Pepe, where both Mercedes and I shared about our experience being filled with the Holy Spirit in our lives. Amazingly, a couple was there from Latin America who were new believers, and when we prayed for them they were filled with the Holy Spirit for the first time in their lives. In fact, the wife fell to the ground and experienced a great encounter with God as the Holy Spirit filled her. Mercedes’ Spanish and me knowing quite a bit of Spanish now was a huge help as this couple didn’t speak much English. We also were able to spontaneously minister to our friend Aura who came over from Vancouver to visit the Island, as well as share some words at a night of worship meeting of different people from different parts of Canada, some who spoke French. Harald Bredesen shares some words about our ministry. Hiking along the beautiful coastline of Vancouver Island. 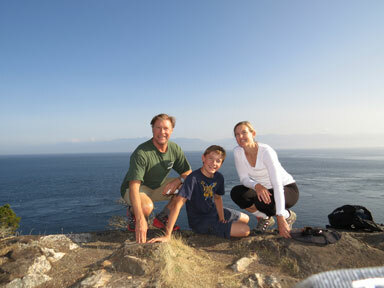 We were thankful to also get some great hiking in on the Island while there. In fact, Travel and Leisure Magazine rated Vancouver Island as one of the top destinations for hiking in North America due to a broad range of magnificent hikes in fairly close proximity. We also got to experience some time on the coast out in Tofino again. We were stoked to use a retreat house for a couple of days that a generous sister offered for us to use, which made our time out there very refreshing after all the ministry we had just done. We were blessed to meet and connect with a couple of the local ministers while there too. It was an incredibly awesome experience the way the Lord opened everything up so spontaneously and sovereignly, and then how all the meetings were so powerful, with the Holy Spirit moving in such a glorious way. As we look back on all that the Lord did, we rejoice in seeing how He went before us and opened so many doors. Glory!!! Thanks for your prayers and support! We truly appreciate it, as it keeps us going and reaching out to equip and empower the next generation to do the works of the Kingdom of God in Jesus’ Name!